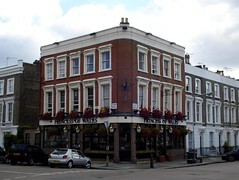 Pub in Primrose Hill, near Chalk Farm Station. It has a characterful interior, with retro ceramics displayed around the walls, and a raised seating area near the front with mini armchairs and a line of potted plants on the windowsill, each in a different pot. Large windows at the front let the light in, and there's also some seating out on the pavement (the street is a fairly quiet one). Kake visited on a Thursday afternoon in September 2008. Beers available were Adnams Bitter, London Pride, and another one called something like Merlin's Oak. I had a couple of halves of Westons (either Vintage or Organic, I think, can't remember price and can't find my notes). The place was pretty much empty throughout my visit, though there were a few people wandering in and out who I think were off-duty staff members or otherwise connected with the place (including a child or two). There was no piped music. After I bought my second half, I decided to investigate the beer garden. It was very exciting! It's reached via a staircase down inside the pub, which takes you to a cellar bar (unstaffed on my visit). The cellar bar has a couple of emergency-exit-type doors which lead out to the garden - don't do as I did, and close these behind you, since you will then be stuck (luckily someone had come and sat in the cellar bar by the time I wanted to get back out again, and he rescued me). The beer garden isn't covered, but it does have a trellis above it with climbing plants, and there's a collection of old pans and plates and things hanging around the place photo. I didn't see any ashtrays, but signs indicated that smoking is permitted there. Food is served noon-3pm and 7pm-9:30pm Monday to Saturday, and noon-5:30pm Sunday. Last visited by Kake, 18 September 2008. Opening hours and food times taken from Time Out website, April 2008. Last edited 2013-05-10 07:50:13 (version 16; diff). List all versions. Page last edited 2013-05-10 07:50:13 (version 16).